In the operation of hydraulic systems, there must be a flow of fluid. The amount of flow will vary from system to system. To understand power hydraulic systems in action, it is necessary to become familiar with the elementary characteristics of fluids in motion. The quantity of fluid that passes a given point in a system during a specific unit of time is referred to as the volume rate of flow. Gallons per minute is the usual method of expressing volume rate of flowin hydraulic systems. For example, one gallon of fluid passes a specified point in 6 seconds, making the volume rate of flow 10 gallons per minute. 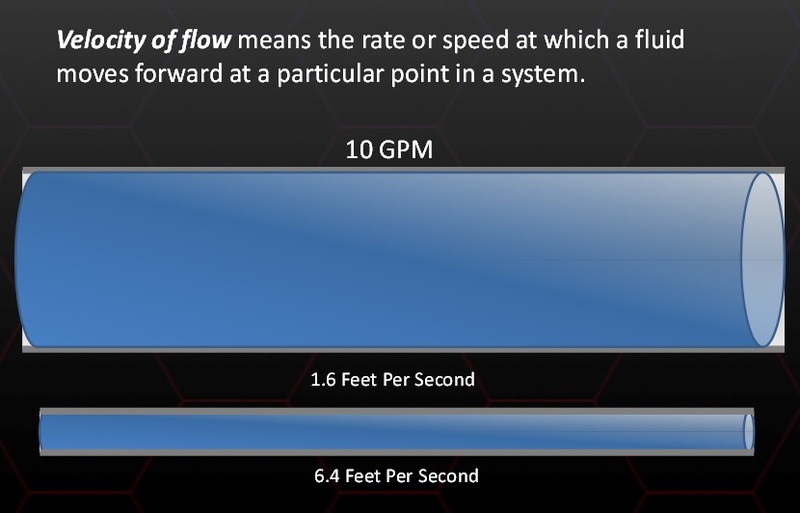 Velocity of flow means the rate or speed at which a fluid moves forward at a particular point in a system. This usually is expressed in feet per second. Shown here are two pipes of different diameters. The upper pipe has a diameter of 2 inches and the lower pipe has a diameter of a half an inch. If a volume rate of flow of 10 gallons per minute is applied to both pipes, the fluid will have to flow significantly faster in the pipe with a diameter of half an inch to move the same amount of fluid as the pipe with a 2 inch diameter. Volume and velocity of flow are often considered together. 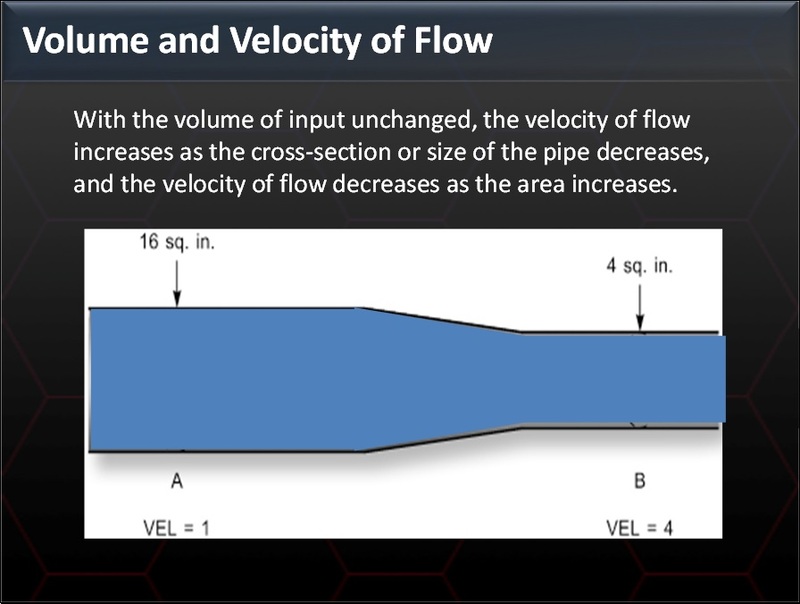 With the volume of input unchanged, the velocity of flow increases as the cross-section or size of the pipe decreases, and the velocity of flow decreases as the area increases. In a stream, velocity of flow is slow at wide parts of the stream and rapid at narrow parts even though the volume of water passing each part is the same. As shown below, the cross-sectional area of the pipe is 16 square inches at point A and 4 square inches at point B. The velocity of the flow at point B is four times the velocity at point A. At quite low velocities or in tubes of small diameters, flow is laminar. Laminar flow is defined as a flow situation in which fluid moves in parallel or layers. Laminar flow is shown below. The stream is flowing at a slow, uniform rate with logs floating on its surface. So long as the stream flows this way, each log floats downstream in its own path without crossing or bumping into each other. If the stream were to narrow and the volume of flow remained the same, the velocity of flow would increase. As the velocity increases, the logs would be thrown against each other and against the banks of the stream, and the paths followed by different logs would cross and re-cross. Particles of fluid flowing in pipes act in the same manner. The flow is laminar if the fluid flows slowly enough, and remains laminar at greater velocities if the diameter of the pipe is large. If the velocity of flow is increased or the size of pipe is decreased sufficiently, the flow becomes turbulent. 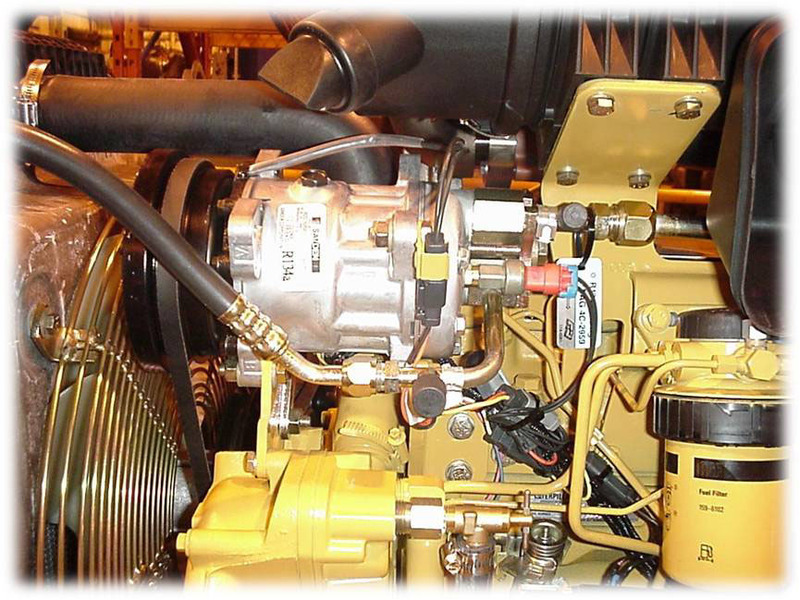 Power hydraulic equipment is designed to reduce friction to the lowest possible level. Volume rate of flow and velocity of flow are made the subject of careful study. The proper fluid for the system must be chosen. Clean, smooth pipe with the best dimensions for the particular conditions is used and installed along as direct a route as possible. Sharp bends and sudden changes in cross-sectional areas are avoided. Valves, gages, and other components are designed to interrupt flow as little as possible. Careful thought is given to the size and shape of the openings. The systems are designed so they can be kept clean inside and so that variations from normal operation can be easily detected and remedied. 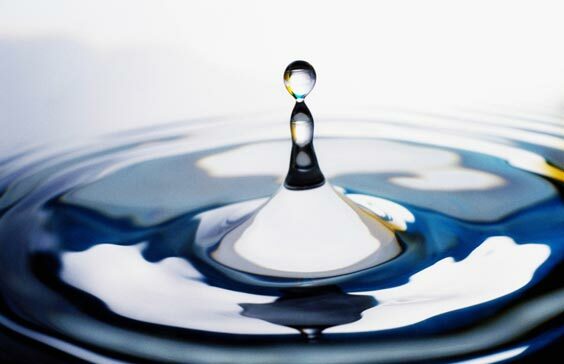 To learn more about Fluid Flow, read the information on our Industrial Wiki. Also be sure to check out our free Module of the Month, Preventive Maintenance; both available through the new odesie® site at www.myodesie.com.